Cloud from FINAL FANTASY VII Headed to Super Smash Bros.; The Legend of Zelda: Twilight Princess HD Revealed; Original Pokémon Games Return. Nintendo debuted a new Nintendo Direct presentation today, revealing details about several new and upcoming Wii U and Nintendo 3DS games. 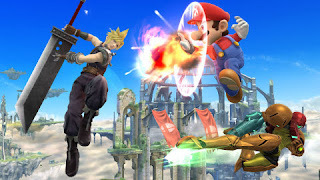 Some of the exciting news included the reveal that iconic video game character Cloud from FINAL FANTASY VII will be added as a playable DLC fighter in Super Smash Bros. for Wii U and Super Smash Bros. for Nintendo 3DS. Other notable announcements included the reveal of an HD remake of The Legend of Zelda: Twilight Princess for the Wii U console, a new Wii U bundle featuring Splatoon and Super Smash Bros. for Wii U and news that the Pokémon games that started it all – Pokémon Red Version, Pokémon Blue Version and Pokémon Yellow Version – will launch with new wireless communication functionality in the Nintendo eShop on the Nintendo 3DS system on Feb. 27. To view the Nintendo Direct video in its entirety, visit http://www.nintendo.com/nintendo-direct. The Legend of Zelda: Twilight Princess HD: Originally released for Wii and Nintendo GameCube systems in 2006, The Legend of Zelda: Twilight Princess HD is a visually remastered remake of one of the most critically acclaimed games in The Legend of Zelda series. The new game launches on March 4 in a bundle with a detailed new amiibo figure modeled after the Wolf Link and Midna characters in the game. The game will also be compatible with five other The Legend of Zelda amiibo from the Super Smash Bros.series. The game’s iconic soundtrack will be offered as a bonus for fans who pre-order the game from select retailers. The Legend of Zelda for Wii U (name not final): Next year marks the 30th anniversary of The Legend of Zelda series. And with that comes The Legend of Zelda for Wii U, the next entry in the storied franchise. During the Nintendo Direct presentation, it was revealed that certain saved data from The Legend of Zelda: Twilight Princess HD on the Wolf Link amiibo can be carried over to this new game. New Wii U Bundle: A new Wii U Deluxe Set that includes the Wii U console and pre-installed versions of hit games Splatoon andSuper Smash Bros. for Wii U launches this holiday season. Pokkén Tournament: A collaboration between The Pokémon Company and BANDAI Namco Entertainment Inc., Pokkén Tournamentis a new fighting game for Wii U that lets players use their favorite Pokémon characters to battle it out in fighting arenas. Fans who purchase a first-run version of the game at retail stores will receive a limited-edition Shadow Mewtwo amiibo card that immediately unlocks the character in the game after tapping it to the GamePad. Pokkén Tournament launches exclusively for Wii U in spring 2016 at a suggested retail price of $59.99. An Ink-redible Splatoon Update: Today at 5 p.m. PT, a free new update for Splatoon adds more than 40 pieces of new gear, including more winter items and some slick bandanas. And on Nov. 13 at 6 p.m. PT, another free new update adds a new stage called Museum d’Alfonsino. Further stages and features will be added in future updates through January. A Nintendo Treehouse SplatoonTournament will happen in December, featuring competitive game play as well as tips for players about setting up their own tournaments. The tournament will be live streamed at http://www.youtube.com/nintendo, http://www.twitch.tv/nintendo andhttp://live.nintendo.com. Animal Crossing: amiibo Festival: By tapping any of the Animal Crossing amiibo figures, players can play as that character in the game’s main mode, a dynamic board game. Players can also tap in their Animal Crossing amiibo cards to play other modes like anAnimal Crossing quiz. The Wii U game that includes the Isabelle and Digby amiibo figures and three amiibo cards launches on Nov. 13 at a suggested retail price of $59.99, the same day as the standalone Animal Crossing amiibo figures. Hyrule Warriors: Legends: Take the epic Hyrule Warriors experience on the go! Hyrule Warriors: Legends offers players the entireHyrule Warriors game on Nintendo 3DS … but with even more content! This time, Tetra, Toon Link and the King of Hyrule from The Legend of Zelda: The Wind Waker join the Skull Kid from The Legend of Zelda: Majora’s Mask on the battlefield. In addition, new character Linkle, a girl who lives in a small village filled with Cuccos and wields two crossbows, joins the large cast of playable characters. Players will be able to command multiple characters, taking direct control of them at any time, leading to new strategic options on the battlefield. Hyrule Warriors: Legends launches for Nintendo 3DS on March 25 at a suggested retail price of $39.99. Fire Emblem Fates: There are multiple adventures waiting to be experienced in Fire Emblem Fates for Nintendo 3DS. By purchasing one of the two main games at a suggested retail price of $39.99 – Fire Emblem Fates: Birthright or Fire Emblem Fates: Conquest – either at retail locations or in the Nintendo eShop starting Feb. 19, players choose to embark on a unique quest with a different story and different experiences. The decision that the player makes early in the game will dictate the game’s story and difficulty. After purchasing one game, the downloadable version of the other is only $19.99 via an in-game purchase. There will even be a third downloadable version in the near future, Fire Emblem Fates: Revelation, for players who own either Fire Emblem Fates: Birthright orFire Emblem Fates: Conquest and want to take on a new challenge and experience an alternative version of the game. For fans of the series, a special edition will be available that includes all three games, an artbook and a Nintendo 3DS XL pouch at a suggested retail price of $79.99. Two DRAGON QUEST Games are Better Than One: The lineup of RPGs on Nintendo 3DS continues to grow with classic gamesDRAGON QUEST VII: Fragments of the Forgotten Past and DRAGON QUEST VIII: Journey of the Cursed King, both remastered for Nintendo 3DS and coming in 2016. Jan. 22 sees the release of Lucas in the Super Smash Bros. series, amiibo figures for Resetti, Blathers, Celeste and Kicks in theAnimal Crossing series, and Series 2 of the Animal Crossing amiibo cards. Typoman from Headup Games and Brainseed Factory (Wii U): Typoman is a puzzling platformer that tells a dark tale of heroes and monsters, where words can either be a blessing ... or a curse! Using the GamePad in a unique way, players set out on an adventure to explore the incredible power of words and how they can be used to survive the environmental hazards and overcome vicious enemies. The game launches exclusively in the Nintendo eShop on Wii U on Nov. 19. Project X Zone 2 from BANDAI NAMCO Entertainment America, Inc. (Nintendo 3DS): Everyone’s favorite Capcom, SEGA and BANDAI NAMCO characters are crossing over once again in Project X Zone 2. But this time Nintendo is also joining the fun by adding Chrom and Lucina from Fire Emblem Awakening and Fiora from Xenoblade Chronicles to the game. Project X Zone 2launches exclusively for Nintendo 3DS on Feb. 16.